The Giro d’Italia comes to Ireland next year. 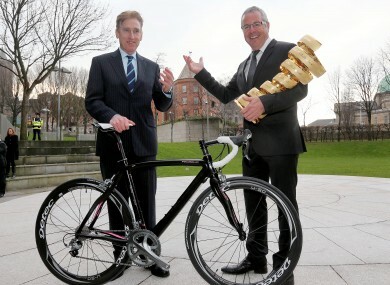 Sean Kelly and Stephen Roche who won the Giro d'Italia in 1987 in Dublin yesterday. STEPHEN ROCHE SAYS Irish sports should get behind the Giro d’Italia when it visits Ireland next year. Belfast will host the ‘Grand Partenza’ and a second stage before an Armagh-Dublin in May 2014. And Roche, who won the prestigious race in 1987, says cycling — a sport rocked by the recent Lance Armstrong developments — is already well down the road of ‘renewal’. “If the Armstrong thing had come out as negative we’d all have been surprised and shocked,” Roche said yesterday at the Dublin launch of the race. “We were all secretly expecting this to happen but probably where the most shock was was in the attitude of the thing. No one thought the whole thing was so structured and so ‘Mafia-organised’; we’re all shocked by that side of it while on the other side of it everyone thought or knew or thought they knew that Armstrong wasn’t clean. The last time a Grand Tour wheeled into Ireland, the Tour de France was scandalised by the infamous Festina affair. But Roche insists enough time has elapsed for the Irish sports fan to get behind the Giro. “If we came back in ’99 or 2000 it would have been very hard,” he told reporters. “But now the public have heard it all or feel like they’ve heard it all. So basically I think people are saying the sport is a super sport and the sport has done so much to clean itself up. Roche’s young son Nicolas will be amongst the peloton next summer with his SaxoBank team. And his father reckons the sport and its riders are subject to unfair scrutiny in recent years. “[Cycling] is getting a raw deal,” Roche agreed, “but there’s no point moaning about that. That’s the way it is. It’s just unfortunate that in other sports when there’s a positive test, there’s nothing about it in the papers or very little. And now football are saying, there’s no doping in football and all of a sudden they’re asking them to participate in the biological passport. Email “'Cycling gets a raw deal' -- Stephen Roche says it's time to move on from sport's doping history”. Feedback on “'Cycling gets a raw deal' -- Stephen Roche says it's time to move on from sport's doping history”.